Welcome to Traders.com Advantage! To access content in this premier section of our website, you must be a registered user. If you are not currently registered with Traders.com Advantage and you would like to sign up for a free 1-month trial, click here. If you are a current subscriber or a current trial registrant, click here to log into the site. If you have forgotten your Subscriber ID, click here to have your Subscriber ID sent to you. For additional information about Traders.com Advantage, click here. 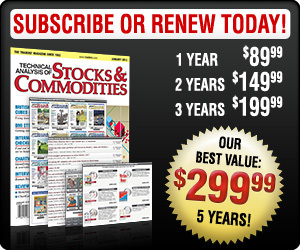 You can choose to subscribe to Traders.com Advantage at any time for just $89.99 a year!